We are happy to announce that this year EVRYTHNG will again co-organize the International Web of Things workshop. As every year the workshop will consist of two distinct (but quite complementary parts). First, the WoT hackathon where makers and tinkerers will meet to build awesome prototypes with connected things and products. Then, the WoT scientific workshop where researchers, practitioners and companies will meet to discuss the future of the WoT industry and research. We look forward to many of you joining us in Zurich on September 8 and 9, 2013. The call for paper for the scientific part is now open (see below) and so is the registration for the hackathon. CALL FOR PAPERS – Fourth International Workshop on the Web of Things (WoT 2013) in conjunction with UbiComp 2013, Zurich, September 8-12, 2013. 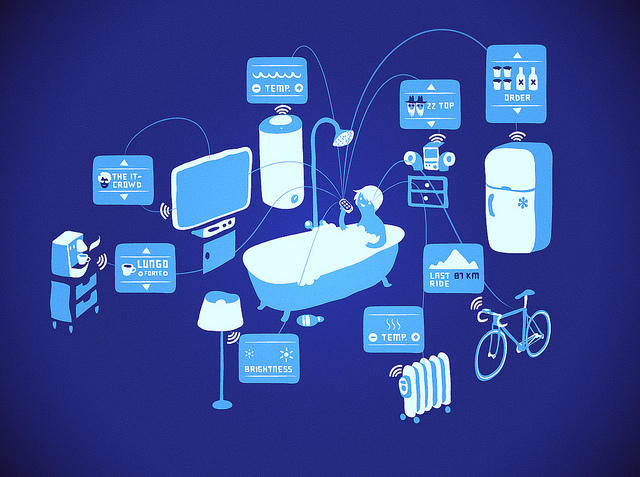 The Internet of Things has become a well-known brand for a set of research issues in the pervasive and ubiquitous computing communities. The focus of this research theme has mostly been on establishing connectivity in a variety of challenging and constrained networking environments. Our hypothesis is that the Web of Things is the next logical step in the ongoing evolution of how pervasive and ubiquitous computing have enabled new applications and provided new opportunities. The Web of Things takes the next step from establishing connectivity and thus the ability to communicate with real-world things, to a vision where physical devices become seamlessly integrated into the Web – not just through Web-based user interfaces of specialized applications, but by blending into the hypermedia information space created by the Web and its architectural principles. WoT 2013 solicits contributions in all areas related to the Web of Things, and we invite application designers to think beyond sensor networks and Web applications, and to imagine, design, build, evaluate, and share their thoughts and visions on what the future of the Web and networked devices will be. Continuing the successful Web of Things workshop series at PerCom 2010, Pervasive 2011, and Pervasive 2012, this workshop aims at exploring the use of principles and technologies at the core of the Web such as Representational State Transfer (REST), syndication (e.g., Atom), and real-time Web technologies for providing access to ubiquitous computing services. It aims at exploring and tackling the challenges to achieve a seamless Web of Things where the Web’s architectural principles are applied in a way that makes Web-enabled things usable across the largest possible set of application scenarios. Integration of embedded computers, wireless sensor networks, every-day appliances, smart gateways, and tagged objects (RFID, barcodes, QRs, NFC) using a Web approach. This fourth edition of the Web of Things workshop series will provide an interactive forum for WoT researchers to learn about and discuss existing efforts related to Web-based interactions with smart things. In order to ensure a high-quality technical session, submissions must cover one of the topics above and not exceed ten (10) pages in the UbiComp 2013 SIG Adjunct Proceedings Template (available at ubicomp.org). Research papers must be original prior unpublished work and not under review elsewhere as they will be published to the ACM digital library and listed on DBLP. All submissions will be peer-reviewed and selected based on their originality, merit, and relevance to the workshop. Submission requires at least one author to present the paper on-site. If you can, we encourage authors of accepted papers to bring a prototype and demonstrate it at the workshop, as part of an open demonstration session. Dave Raggett, World Wide Web Consortium.